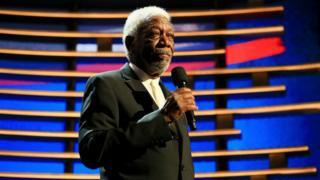 Image caption Morgan Freeman: "We landed safely without a scratch... I cannot say the same about my plane"
A private plane carrying Oscar-winning actor Morgan Freeman was forced to make an emergency landing, but the star and his pilot were unhurt. The plane blew a tyre on take-off from Clarksdale, Mississippi, on Saturday. The SJ30 jet made a forced landing in Tunica, about 40 miles (65km) away, where it went off the runway. In a statement, the Shawshank Redemption star said: "Sometimes things don't go as planned and a tyre blew on take-off, which caused other problems." He continued: "But thanks to my excellent pilot Jimmy Hobson we landed safely without a scratch. "I cannot say the same about my plane. I appreciate the concern and prayers for our safety." The 78-year-old has been nominated for seven Oscars for films including Driving Miss Daisy, Street Smart and Invictus, and won in 2005 for his role in Million Dollar Baby.